I wanted to make oatmeal cookies the other day because I got a bug up my skirt about having cookies in a cookie jar, but I realized that I didn’t have any rolled oats. 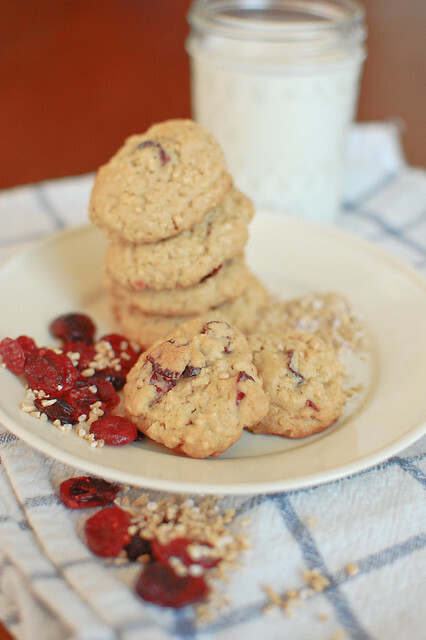 I have massive quantities of steel cut oats, though, and I wondered if I could actually use them in cookies. I figured them might result in pucks that would crack a tooth, but figured it was worth a google. Turns out, it’s no problem! I followed this recipe loosely and changed things a bit. The steel cut oats work no problem – they don’t need to be soaked or pre-cooked or anything complicated. The result is a cookie with a tiny bit of bite to it – just enough to seem almost nutty. I like little cookies, so I based the cooking time on cookies made with about 1 tablespoon of dough, if you like them bigger just extend the cookie time a bit. – Beat the heck out of the butter in the mix. Then beat it some more. Then add in the sugars. Once the butter and sugar are blended, add the applesauce, egg and vanilla and beat a bunch more until it’s all creamy. 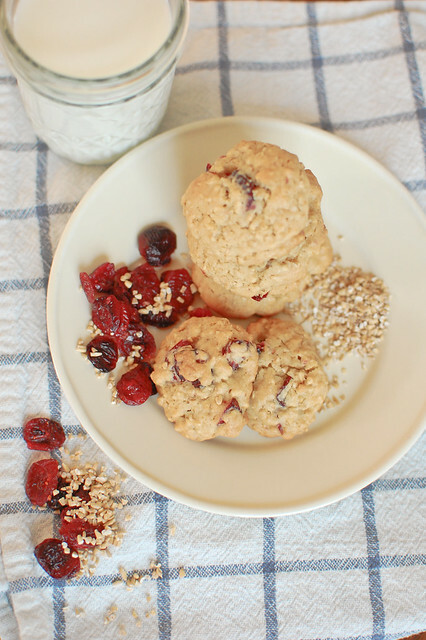 – In a separate bowl, mix the flour, oats, baking soda, baking powder, salt and cranberries. – Add the flour mixture to the butter mixture a bit at a time until it’s all incorporated. – Refrigerate the dough for a good chunk of time. 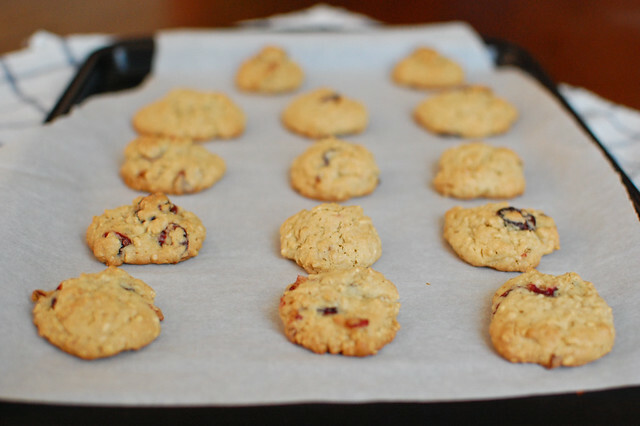 – Spoon dough onto parchment-lined cookie sheets in tablespoon-ish sized balls. – Baked for 8-10 minutes until edges just start to look brown. These are delicious! I’m trying not to have another one as they cool. Not too sweet with a little texture. Yum! I added some chopped pecans and used orange flavored cranberries. I am SO glad that I found your recipe! These are super yummy and moist! I used a raisin medley from Trader Joe’s and raw sugar, fine ground whole wheat flour. Good stuff! I bought some steel cut oats and then searched for a cookie recipe. I tried this one and it is very good. I used all whole wheat flour, dried cherries, and added flax seed meal. I forgot to refrigerate them and they still turned out great! I can see making these again, maybe adding some cinnamon, or chocolate chips. Oh thank goodness I found this recipe and all the wonderful reviews! Thank you for helping me get over my fear of baking steel cuts!